NOVO-OGAREVO, April 09. /ITAR-TASS/. 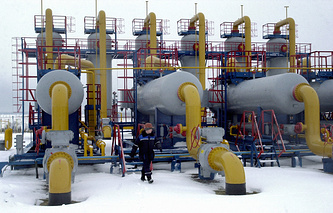 Russian President Vladimir Putin has asked the gas monopoly Gazprom to refrain from demanding prepayment for gas from Ukraine until more consultations have been held. In that case, Putin said, Russia would be acting strictly in compliance with the contract. “I will give thought to consultations with our partners. I am asking the Foreign Ministry to arrange for this work,” Putin said.